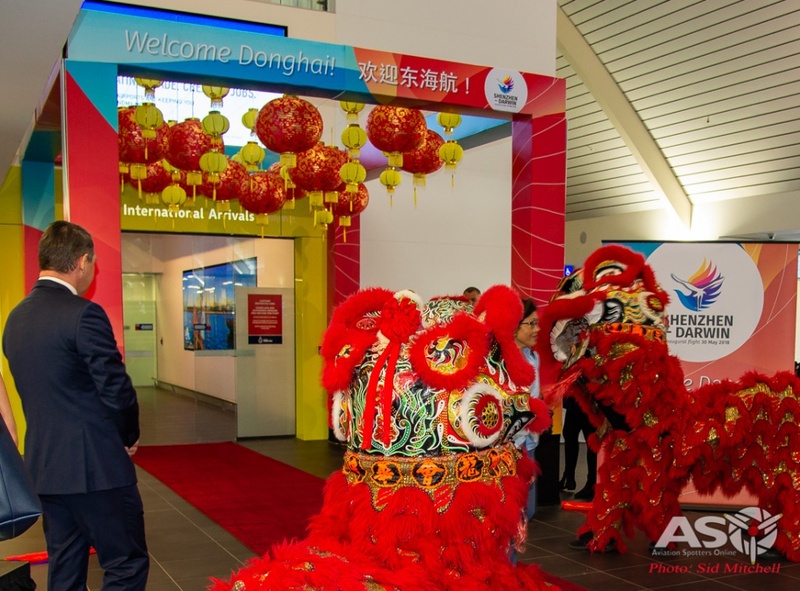 Chinese carrier Donghai Airlines in partnership with Darwin International Airport, has launched its inaugural passenger service to Australia, with the arrival of the colourful B-7100. 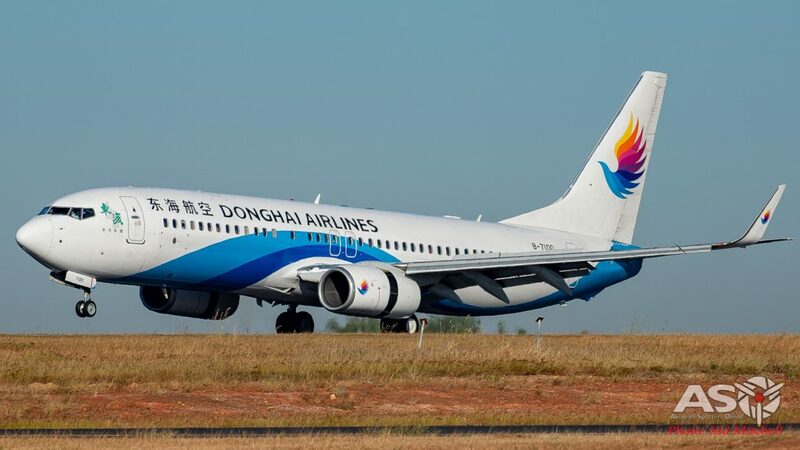 As of Wednesday May 30th 2018, Donghai Airlines is operating it’s Boeing 737-800 aircraft on the Shenzhen – Darwin route, currently a twice weekly schedule. 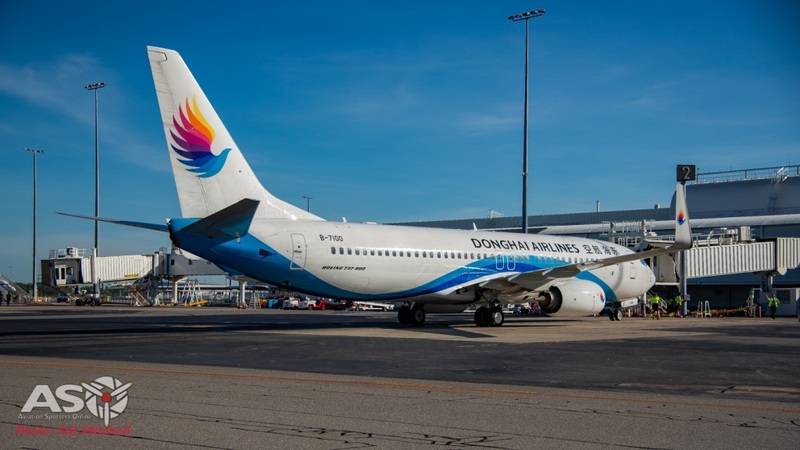 Donghai Airlines is based at Shenzhen Bao’an International Airport in Guangdong, China, and Darwin will be the third international destination for the airline after both their Thailand and Vietnam destinations. 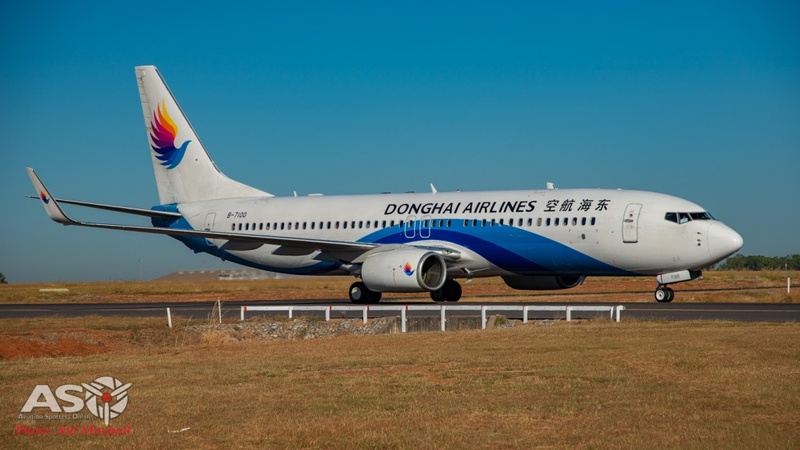 Established in 2002 as Shenzhen Jiehui Freight Aviation Co., Ltd. it wasn’t until September 2006 that Donghai Airlines commenced commercial flights as a domestic cargo operator. 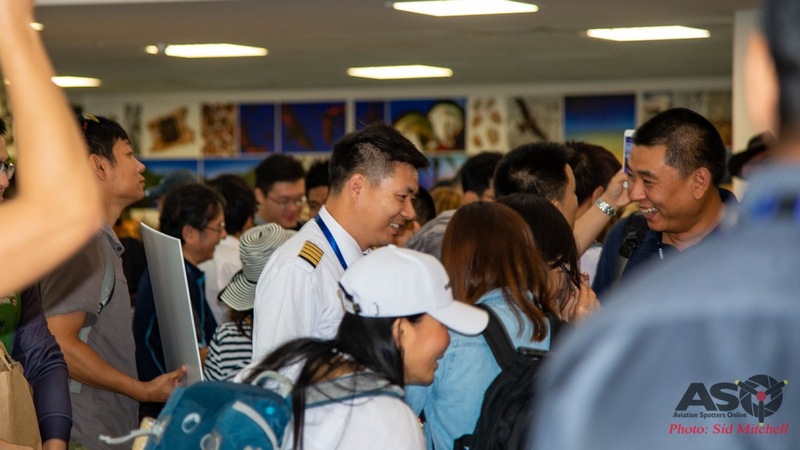 The following year they were issued an international cargo charter licence to destinations such as Dhaka, Osaka and Seoul. 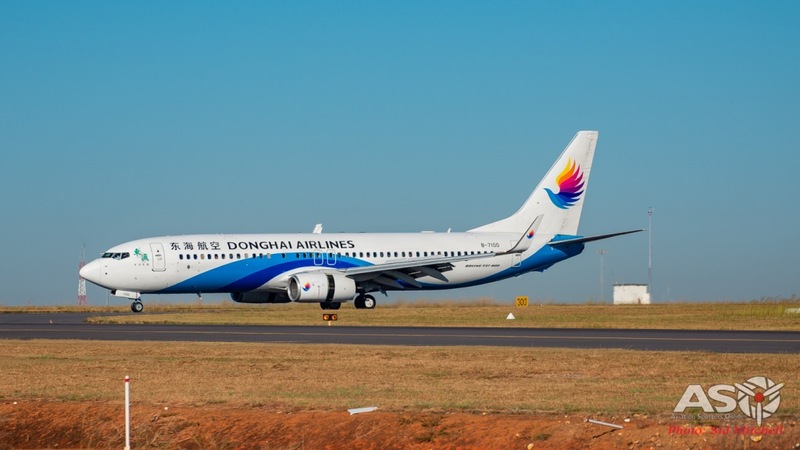 In March 2014, Donghai operated it’s first passenger flight and during 2015 concentrated on transitioning from cargo freight to predominantly passenger services. 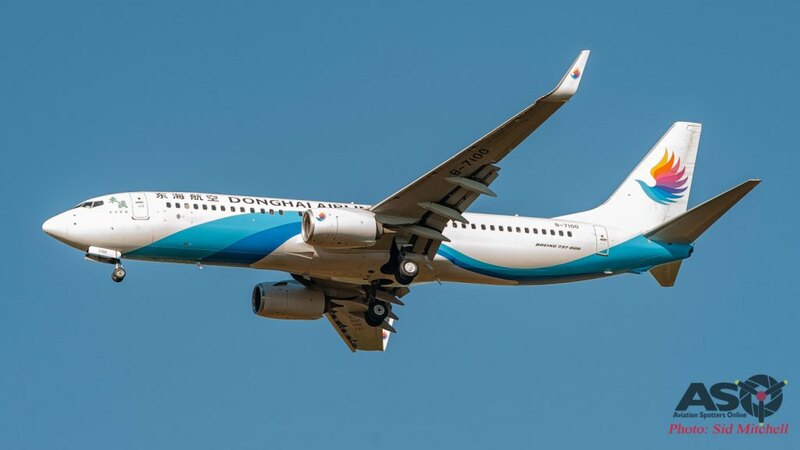 By late 2016 they had been granted permission to operate as an international passenger transportation business. 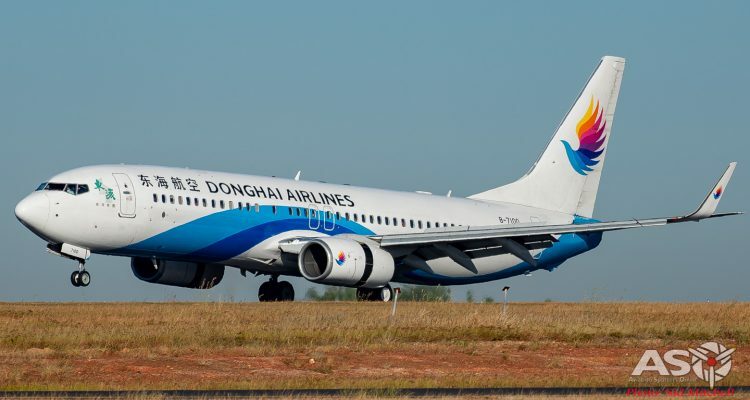 As of February 2014, the airline had signed several contracts with Boeing to supply 25 Boeing 737-800 aircraft and in 2016, Donghai Airlines and Boeing also signed up the intention to purchase 25 737 MAX8 and 5 787- 9 passenger aircraft. 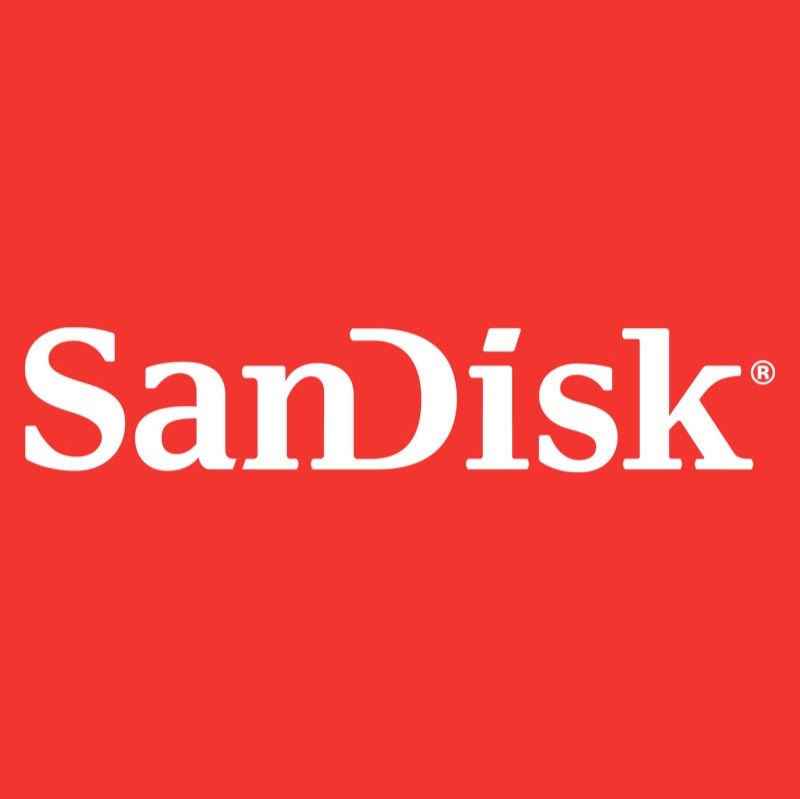 Logo interpretation – Nine color seagull – Seagulls, the sea elf, are symbols of courage, wisdom, and tenacity. The nine wavy gulls, shaped like wings of seagulls, are riding the wind and waves on each tail and winglet. 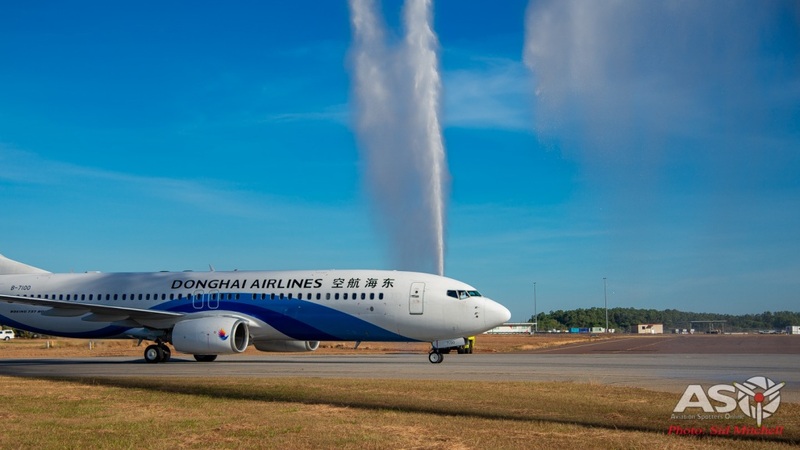 Initial services between the cities will be provided by one of the current 18 Boeing 737-800 aircraft, although Yang Jianhong, Chief Executive Officer of Donghai Airlines, has indicated that the aircraft will be upgraded to the newer Boeing 737-MAX 8 some time in the future. 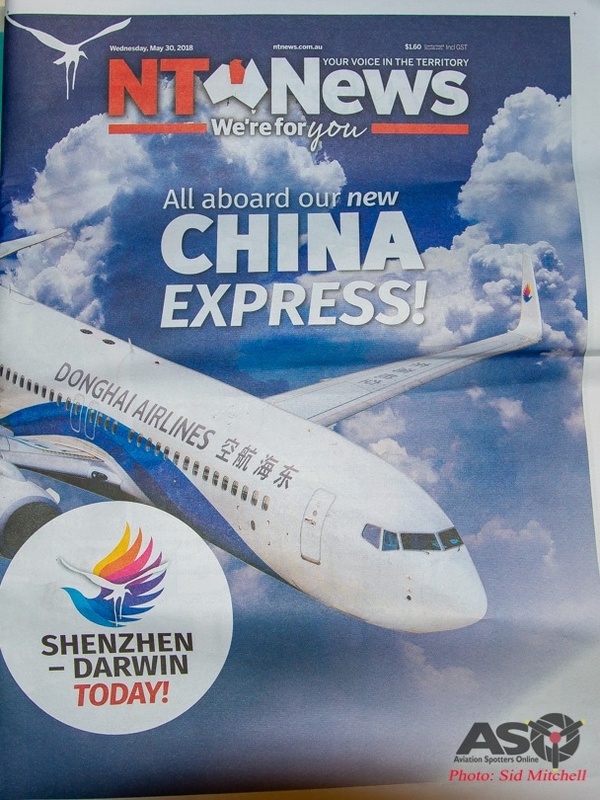 In a press release early April, NT Airports CEO Ian Kew, said the new air link between Darwin and China would create over 35,000 airline seats directly into the market – “Uniquely, Donghai Airlines will be the only airline from China to serve Australia with a Boeing 737- 800 aircraft, providing a more cost effective and economically efficient aircraft that will enable very competitive fares to be offered,” Mr Kew said. Arrivals hall preperations after passenger immigration. 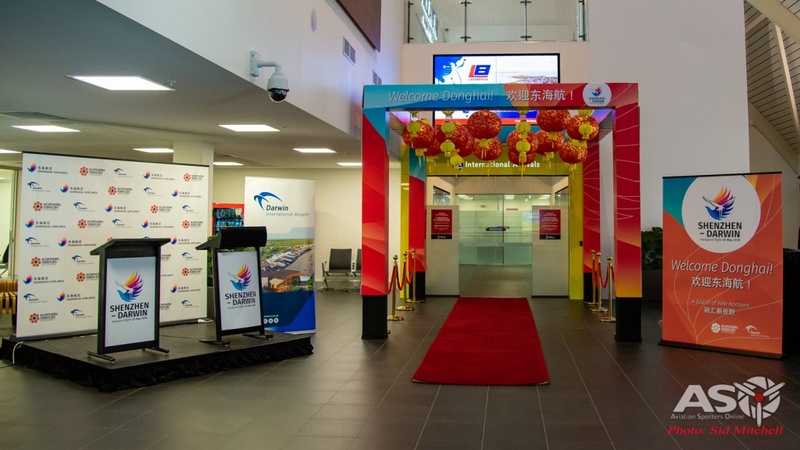 On each Wednesday and Sunday passengers will see flight DZ6223 Shenzhen (SZX) to Darwin (DRW) and a return flight DZ6224 from Darwin to Shenzhen, scheduled to operate along the route. 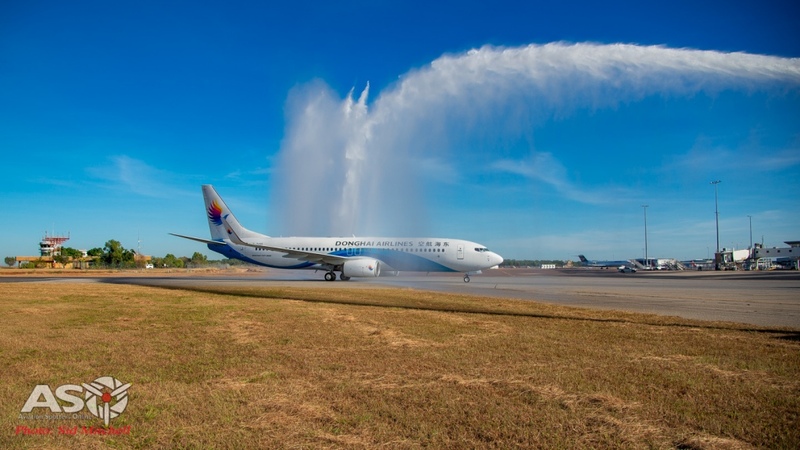 The inaugural flight EPA/DZ6223 left Shenzhen Boa’an International airport at 0140CST 30th of May 2018 and after a 5:40min flight, touched down in Darwin at 0850 ASCT. Flight DZ6223 about to touch down for the first time in Darwin. 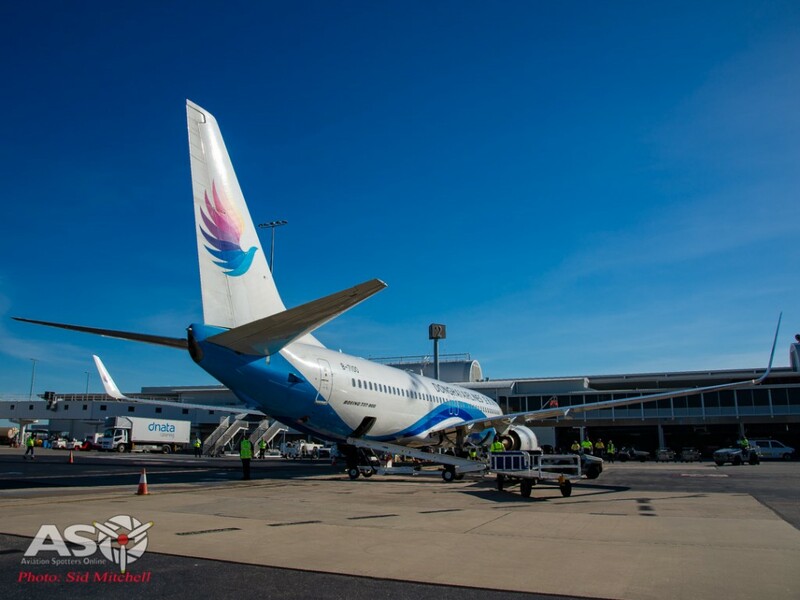 I was priviledged to be invited to the arrival by Darwin Airport and again be given access airside to capture the arrival from near to the runway. 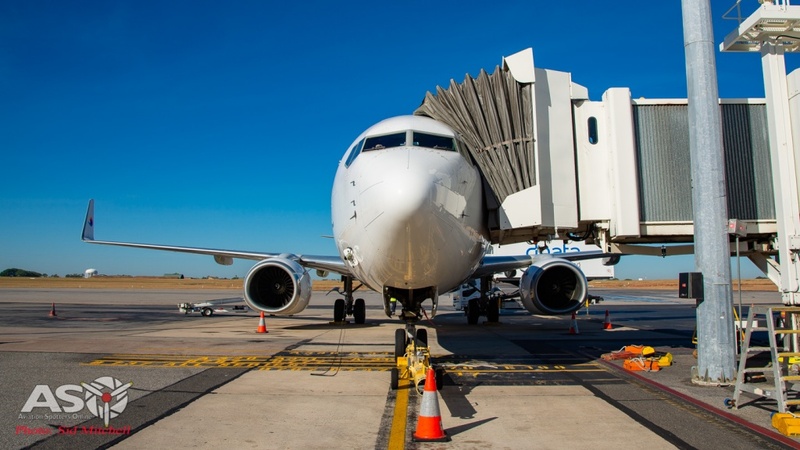 Riding with Bob in one of Darwin International Airport’s safety vehicles, we drove out and parked ready to watch the arriving aircraft land, and then taxi from runway 11 to the International Terminal – Gate 2. Braking on Darwin’s 3,354m runway. 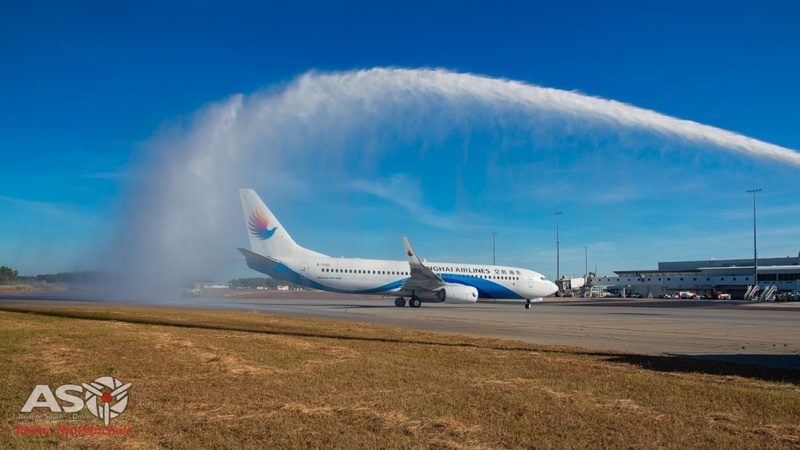 In a long standing tradition dedicated to special occasions, Airservices Aviation Rescue Fire Fighters (ARFF) positioned two of their Rosenbauer ARFF vehicles either side of the taxiway ready to create a water cannon salute for the aircraft to pass through. 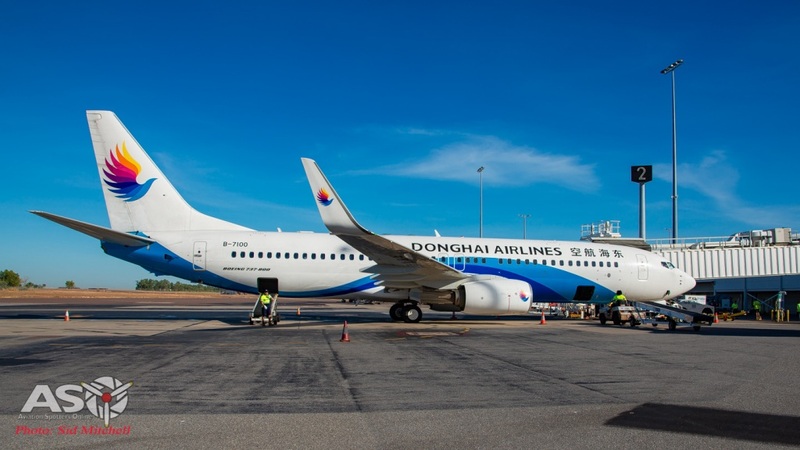 With company representatives, public and the media watching on, Donghai Airlines B-7100 taxied through the welcome arch and on to Gate 2 at Darwin International Airport. 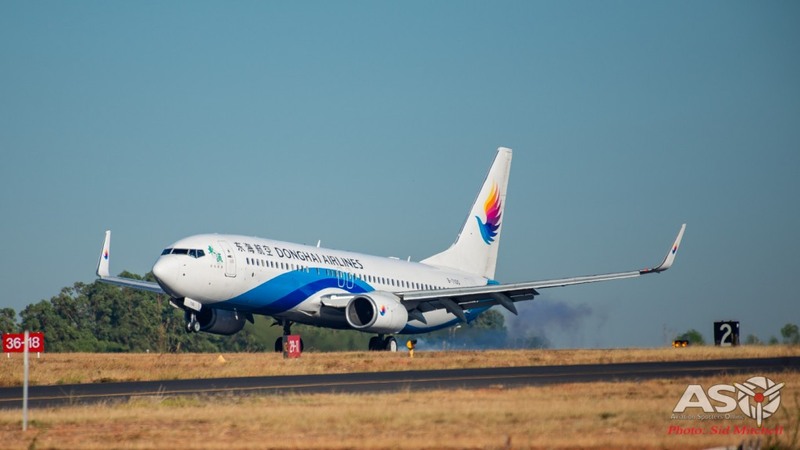 Interestingly Bob tells me that the Gate 1 and 5 CIMC Tianda aerobridges were actually manufactured in Shenzhen and installed at Darwin some years ago…. another small link between the two cities. 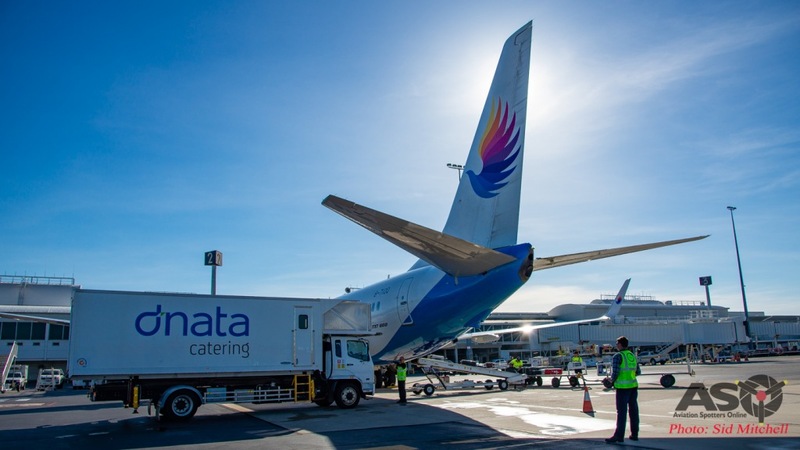 After parking and shutdown, the ground services teams spring into action transferring baggage, performing after flight services and replenishing consumeables for the return flight. 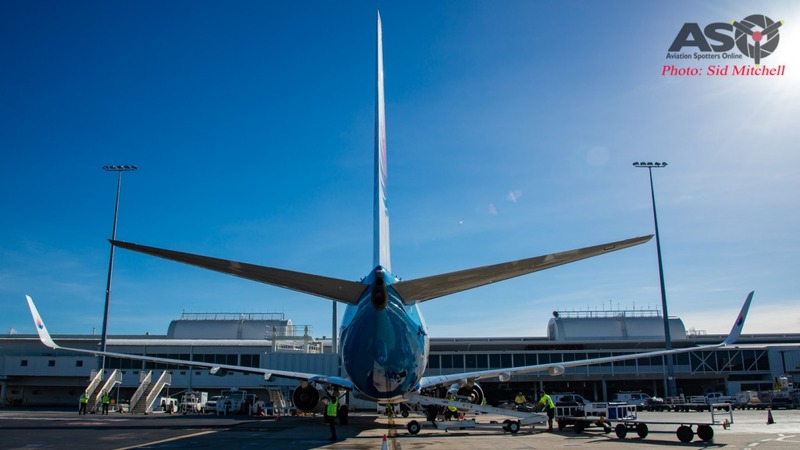 Bob invites me to walk the apron around B-7100 as the ground staff move vehicles and equipment about the new arrival, performing their respective tasks. 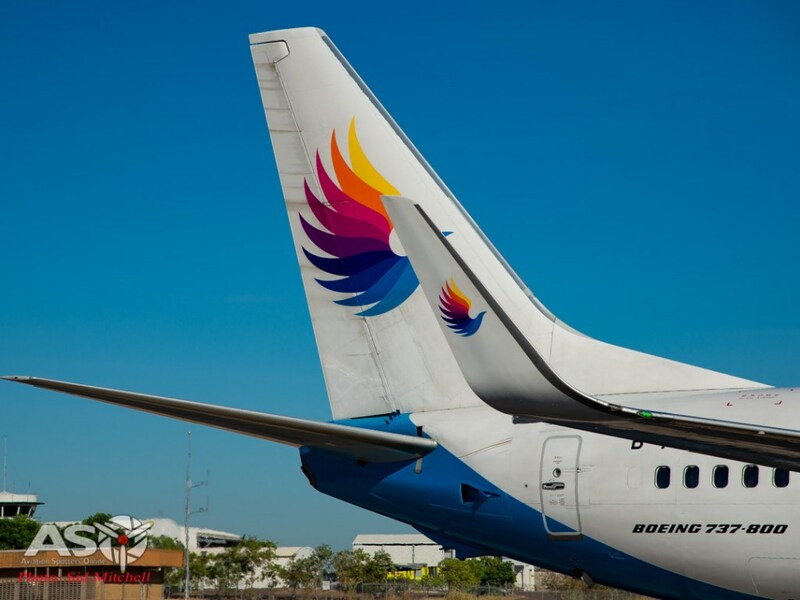 We leave the B737 on the bay but it will soon be relocated off the international gates until nearing it’s return flight, DZ6224, departure time of 9:45p.m. 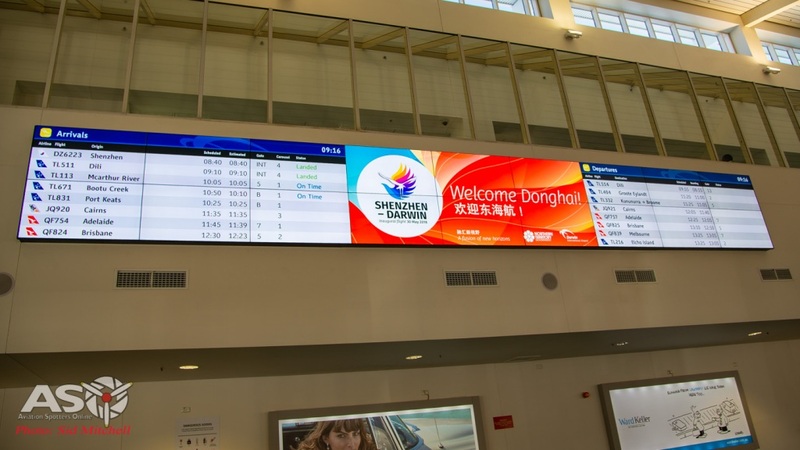 We return inside to wait as the passengers and crew transit through immigration heading towards a large welcome in the main terminal passenger hall. 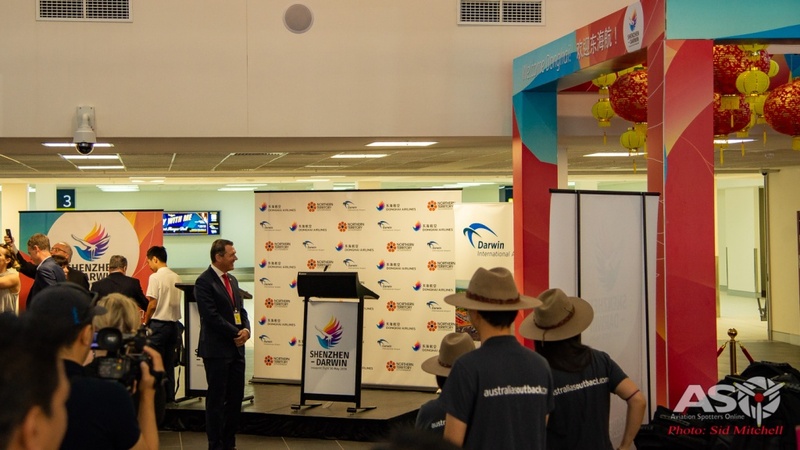 Representatives from Darwin International Airport, Donghai Airlines in Australia, the N.T Government, the Chinese Community plus local business Crocodylus Park had put on a welcoming show not often seen at the airport. 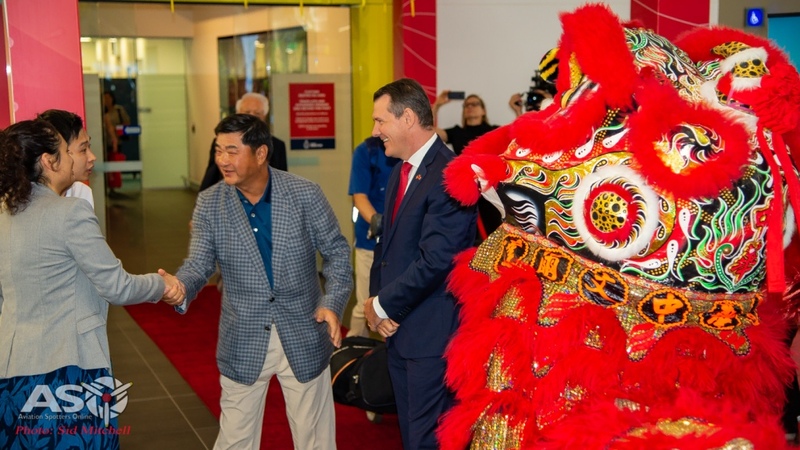 Chief Minister Michael Gunner welcomed some passengers to the Northern Territory, while friends and relatives were waiting, as the flight was a mix of family members, first time visitors, business folk and even a Hong Kong movie star. Slowly the steady trickle of travellers began to pick up coming out of the immigration lounge. 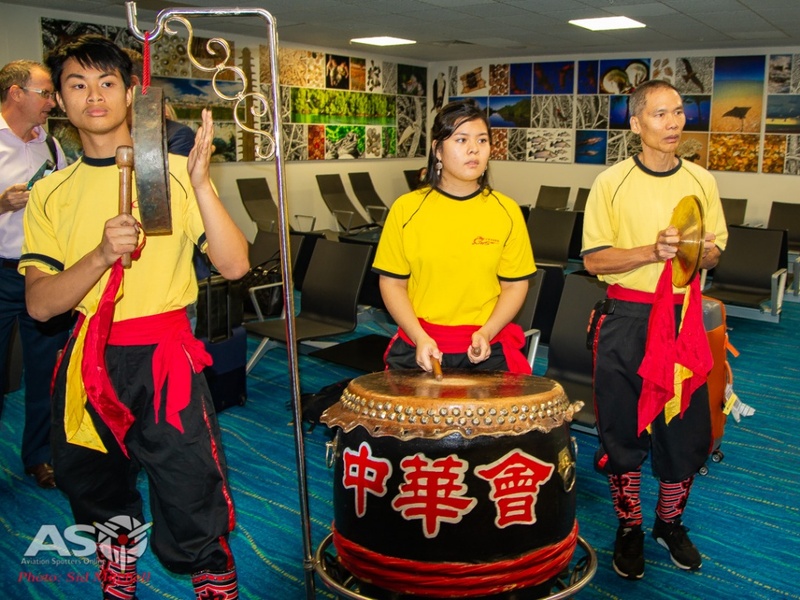 Traditional musicians were playing percussion music as officials waited for executives of Donghai Airlines to emerge. 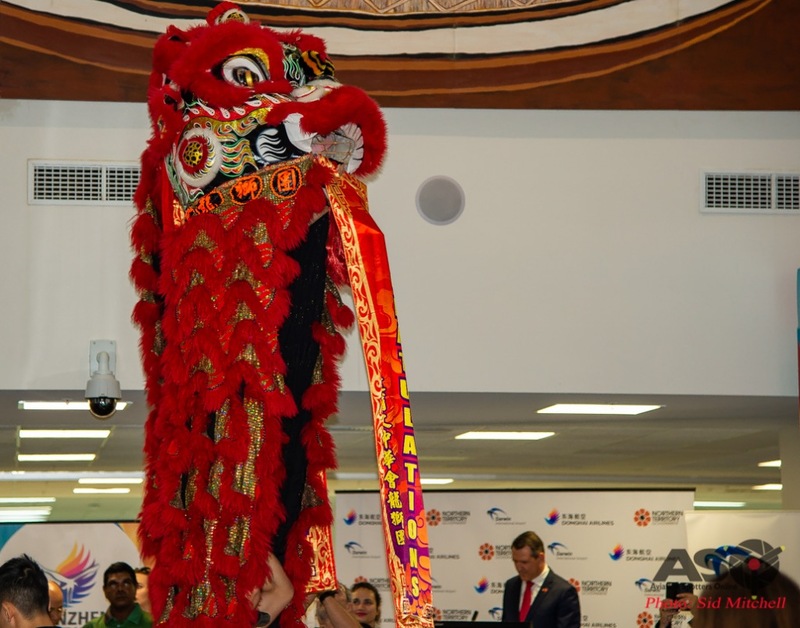 A traditional Lion dance was being performed by the Chung Wah Society Lion Dance Troupe in sync with the music, weaving their way through the onlookers, which only added to the atmosphere of this special occasion. 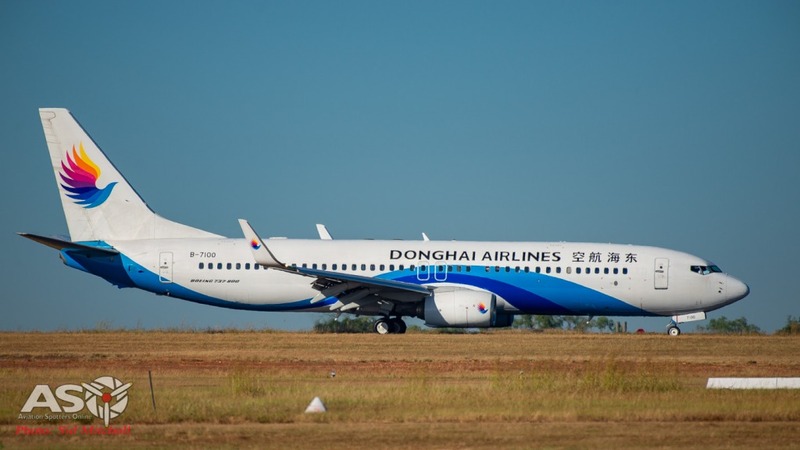 Eventually Donghai Airlines chairman Mr.Wong Cho-Bau and Donghai Airlines Chief Executive Officer Yang Jianhong emerged and were welcomed by the Cheif Minister and other representatives such as Tourism Minister Lauren Moss, returning to Australia on the flight, Darwin Airport and local companies. 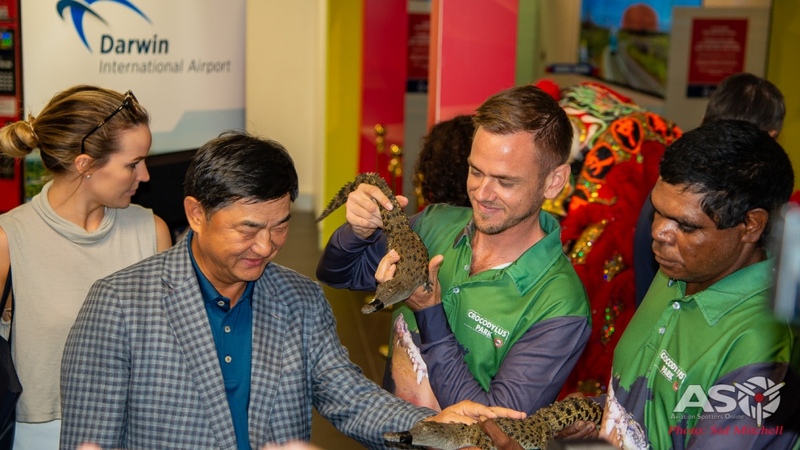 The welcome even included a pair of juvenile crocodiles being presented by staff at well known local attraction, Crocodylus Park. 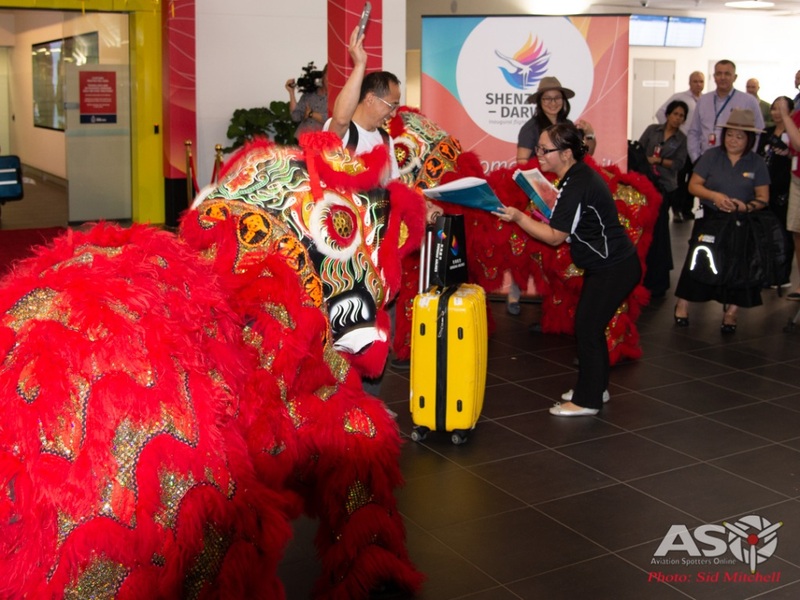 With the Lion Dance completed it was time for some welcome speeches and with translators assisting in the proceedings, the Shenzhen- Darwin and Donghai-Darwin Airport partnership was again announced to the watching crowd, and that future partneships Mr Gunner said he believed the Territory was up to the challenge of giving Chinese tourists a memorable experience. 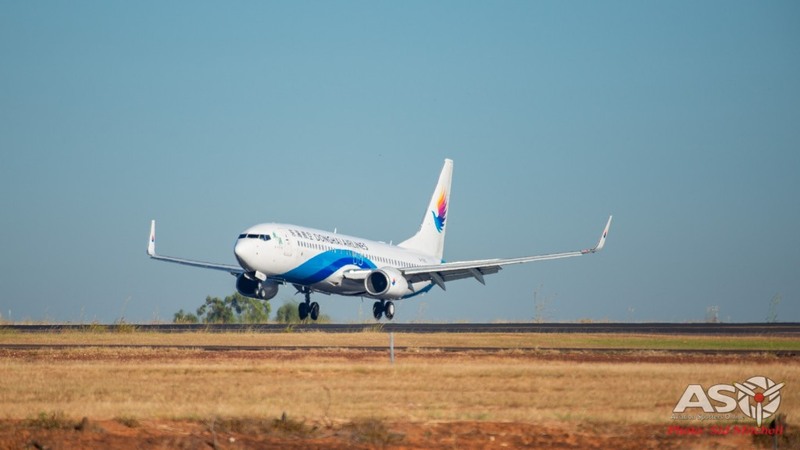 With the loss of a couple of airlines stopping at Darwin recently, it will be good to start to filling that gap again with what are termed – short-haul travellers. 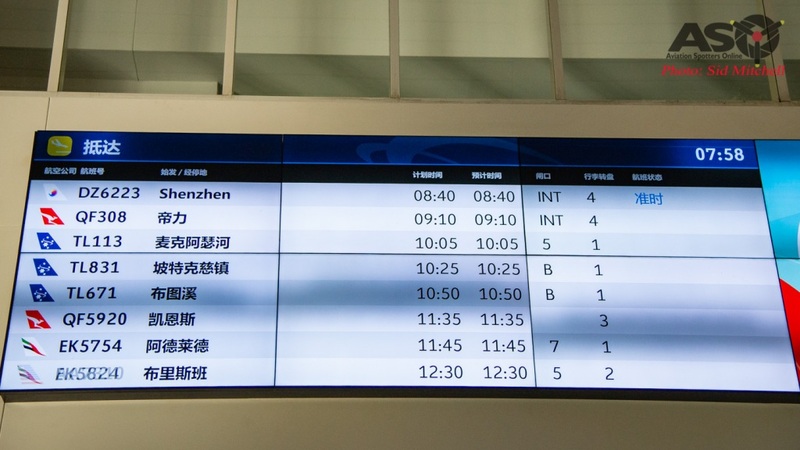 Donghai Airlines looks very capable of filling that void as the flight is only 5 and a half hours long…. either way. Certainly a destination for Darwin residents to consider also. 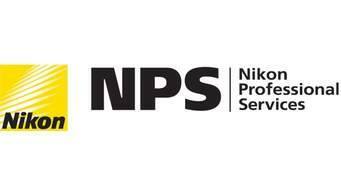 I would again like to thank Bob the N.T Airports Aerodrome Safety & Standards Manager for escorting me airside and Jill from NT Airports Communications & Media for arranging my visit, much appreciated.